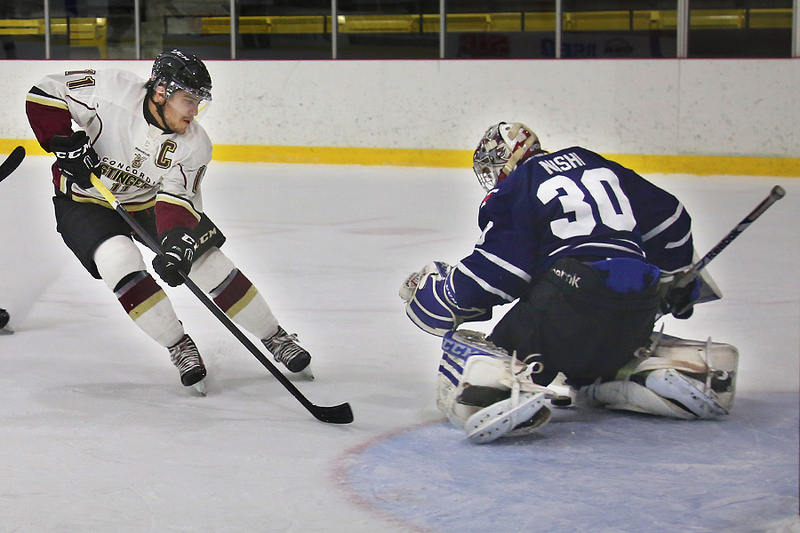 The Concordia Stingers men’s hockey team was looking to kick off 2015 on a positive note as they hosted the Toronto Varsity Blues on Friday, Jan. 9. The Stingers did just that with an impressive 5-3 win over the strong Toronto squad. The Stingers started the game fast and just 19 seconds into the game, they jumped on the board with a 1-0 lead. Forward Jessyko Bernard got a great pass from Gabriel Bourret and wired a quick shot past the Blues goaltender for the first goal of the game. Twenty-two seconds later, the Stingers took to the power play when Blues player Michael Markovic got sent to the box for tripping. Toronto managed to kill the penalty and then started to turn the game around as they started to dominate the tempo. Toronto tied the game with 12 minutes left in the first period when Dean Klomp fooled Stingers goalie Robin Billingham with a quick release. Concordia pushed to regain the lead but fell into some penalty trouble when Stefano Momesso got called for roughing. Surprisingly enough, Concordia regained the lead while shorthanded: Bourret sprung Olivier Hinse with a breakaway pass, who tucked the puck past the goal line and restored Concordia’s lead. Toronto pushed and continued to outshoot Concordia but could not beat Billingham. The Stingers got into more penalty trouble when forward Roberto Mormina got called for roughing. Concordia managed to kill the penalty with more extraordinary play from Billingham and, with 46 seconds left in the period, increased their lead. Phillipe Hudon got his first goal as a Stinger and led the Stingers into the first intermission with a 3-1 lead. To start the second period, Toronto decided that a change in net was needed, and Garrett Sheehan replaced Michael Nishi. The change didn’t work. Four minutes later Concordia scored a goal on the power play to increase their lead to 4-1. Stingers forward Marc-Olivier Brouillard got a pass from Hinse and beat Sheehan on his first shot of the night. Toronto finally got another goal on the board and beat Billingham when Christian Finch fired a superb wrist shot past Concordia’s netminder. The period ended 4-2 and, as the Stingers headed into the locker room for the final intermission, the win was within reach. The Blues refused to back down and forced the Stingers to earn the victory. Toronto managed to cut the lead to one when Jeff Brown found the back of the net on a quick snap shot. Despite the tense moments late in the game, Concordia would seal the victory with 30 seconds left on an empty net goal by Antoine Houde-Caron. After the game, Stingers Head Coach Kevin Figsby was proud of his troops. The best player on the ice throughout the game was undoubtedly Concordia’s goaltender, who took a moment to admire his performance after the game. After Friday’s win, the team travelled to Ryerson University on Saturday, Jan. 10. and lost to the Rams 3-2. The Stingers now sit at 7-14 and will try and turn things around on Friday, Jan. 16. when they visit the University of Windsor to play the Lancers.